Photo by Emily Ash. 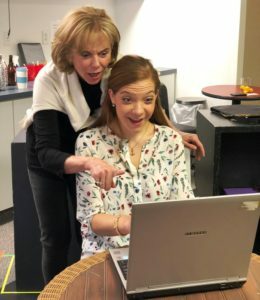 In this rehearsal photo, Katherine Crawford played by Linda Purl checks computer dating activity with Susan Slotoroff. IVORYTON – A renowned scientist once theorized that finding “intelligent life” on other planets in the universe would be like shooting a particular blackbird in a room full of blackbirds, with the lights out. Ironically, the same probability applies for finding a “normal man (or woman)” on an online dating service. Love Quest – a new comedy, which opened at the Ivoryton Playhouse April 25 – explores the journeys of two women in the perilous world of online dating. Kate Crawford, 60, was married for 30-years and divorced for three. Her husband left her for a younger woman and she is dealing with issues of abandonment, old age and the new world order of internet dating. It is a position in which she never thought she would find herself. Her concerned daughter, Megan, posts Kate’s profile on the Love Quest dating site and Kate is thrust into unknown territory. The “gentleman caller” is a thing of the past. Now a relationship is decided in a millisecond with the “swipe” of a finger across your smart phone. And speed dating gives Kate 60 seconds to present herself, 30 seconds too long for many of the younger men who sit across from here. Brook Davis, 35, single, has climbed the corporate ladder in the fashion industry with a driven, single minded focus. Her ambition left her little time for socializing which is just fine with her. Raised in foster homes she has learned to only trust herself. A relationship would only get in her way. However, executives in her firm want her to raise her celebrity profile by being seen and photographed at the right places with eye candy dates. Her assistant, Bové, reluctantly signs her up on Love Quest. Brook is far more cynical than Kate and is more amused than shocked by what she encounters in the world of high speed dating. Kate and Brook meet after a bad date goes awry and become friends and allies in this strange new dating world. This is their story. Love Quest stars Linda Purl* as Katherine Crawford. Many will remember Linda for her roles at Charlene Matlock in Matlock and Ashley Pfister, Fonzie’s girlfriend in Happy Days but her career has included many movie and TV appearances. She can currently be seen in The Oath (recurring), and in recent episodes of Homeland, True Blood, The Office, and Designated Survivor. Sharing the stage with Linda are Playhouse favorites Josh Powell* (My Way) and Mike Mihm* (Biloxi Blues), Jes Bedwinek, Joe Candelora* and Susan Slotoroff will be making their Playhouse debut. Love Quest opens at the Ivoryton Playhouse on April 25 and runs through May 13, 2018. Performance times are Wednesday and Sunday matinees at 2 p.m. Evening performances are Wednesday and Thursday at 7:30 p.m., Friday and Saturday at 8 p.m.